When I decided to pursue being a full-time handmade artist, I started planning my projects. As I began acquiring supplies, one of the things that quickly became apparent was that I needed to decide on the most efficient way to maximize workspace storage. We all have different needs and different types work spaces. Since I am in a house that doesn’t allow for a separate crafting room, I needed to figure out how to maximize the available space in our guest room. I am betting some of you are nodding, and thinking, “yes, I know what it is like to have a combo space with challenges”, while the lucky ones are smiling because they have lots of space for their creative process (yes, I am jealous). 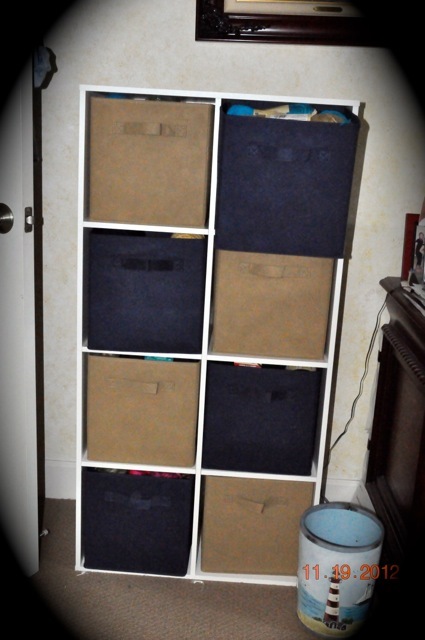 I have to admit that I started with simple storage bins. They were initially in the closet, but soon I outgrew that option. As you can imagine, plastic bins are not the most attractive look for a guest room. At this point, I started looking at storage options that would be appropriate for my space. I decided that my first storage piece needed to hold a wide variety of crafting supplies. I admit the search took awhile. I bounced between trying to fabricate something and finding a ready made solution. In the end I found a company that made a crafting cabinet that would solve the challenge of storing a wide variety of items and it could also hold my printer, which is always a space challenge. The company is called “Home Decorators Collection” and the components are from the “Martha Stewart Living Craft Space“. 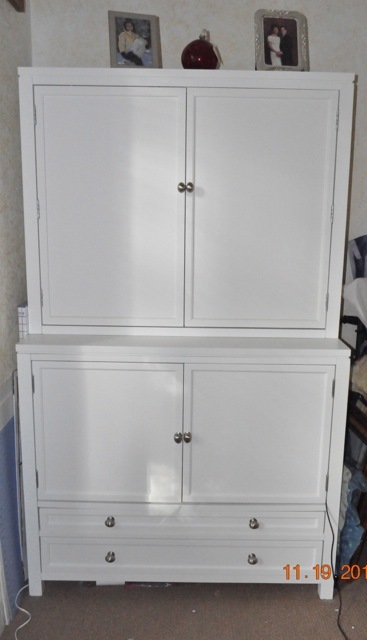 This cabinet is comprised of two components. The upper component has two doors. 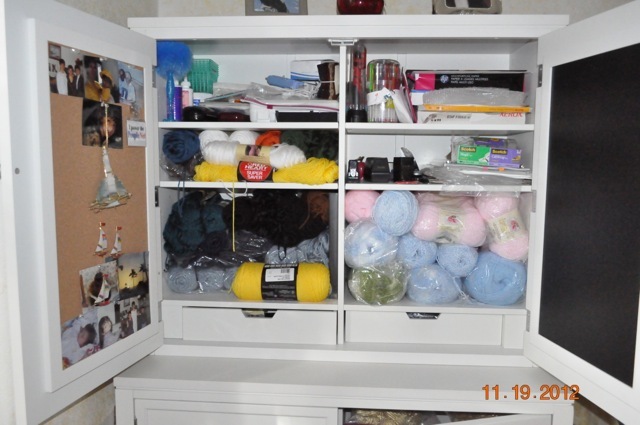 The right side has shelves for yarn, pens, printing supplies, stapler, tape, paperclips, etc. There is a chalkboard on the inside of the door for jotting down notes, and a drawer that holds my scissors, cutting tools, hole punch, crochet hooks, etc. The left side has more shelves for yarn, different types of glue, glue guns, glue sticks, etc. There is a corkboard on the inside of the door, and a drawer where I store print cartridges, post-its, safety pins, push pins, rubber bands, etc. The lower component is divided into two main areas. The upper portion has slide-out shelving with doors and the lower portion has multiple full-length drawers. In the right side of the upper portion is where I store my printer and some bags of bows. 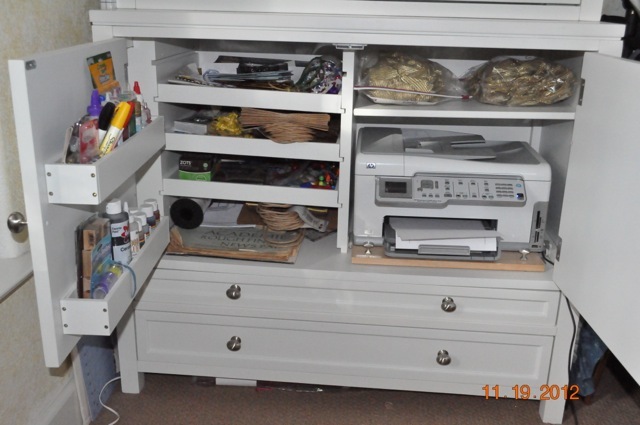 In the left side of the upper portion, I store various small things that are much easier to access because of the drawers being able to slide out. Some examples are small gift bags, paintbrushes, tubes of glitter glue, mini bows, scrapbook zots, gift tins, etc. On the door there are two shelves where I store paints and art supplies that need to stand upright. This is a great space saver and makes finding small things so much easier. 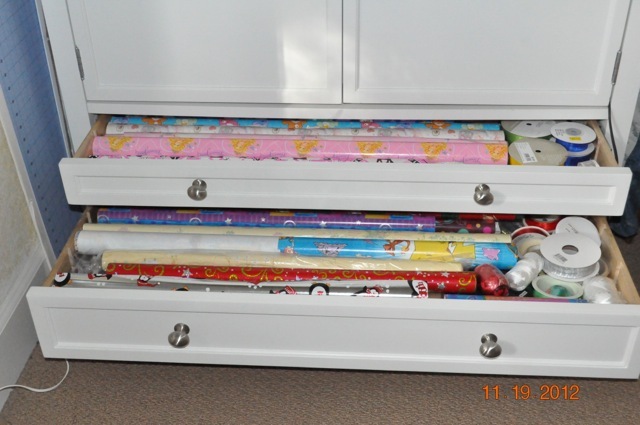 For the lower portion, the full-length drawers are ideal for storing wrapping paper and ribbon. Before this, I had to go outside in the garage and dig through a storage bin to find the paper I wanted. I use ribbon to make bows, which I include in my packaging of my donation items; so keeping them handy is very helpful. I know this was a lot of detail for one storage item, but it took me awhile to decide how best to utilize the various features. To my husband’s delight, the next phase came into play because there were additional supplies that I wanted to get out of the garage. This is where I had to get creative with an area of the room that I hadn’t previously considered which was the window seat. The seat area goes almost the full length of the wall so there was a lot of space not being used. 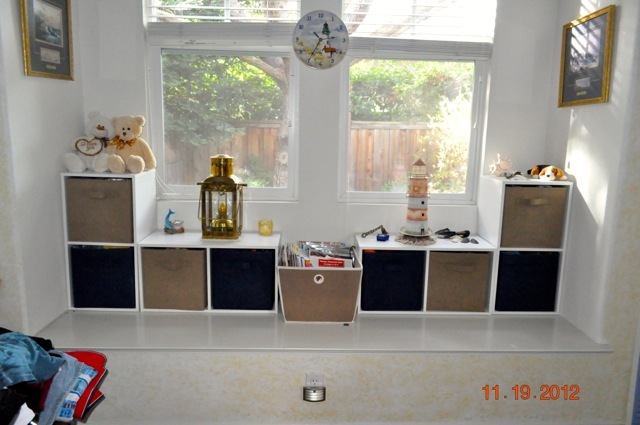 This prompted more research and the result was “ClosetMaid Cubeicals® 2 Cube Organizer” with fabric-covered drawers. These can be found is various stores or by doing an online search, (for example via Google), for “ClosetMaid Cubeicals“. In my case I ordered them online from “Target“. Now for those of you who sew, I know you can make your own drawers and cover them with wonderful fabric to fit the surrounding decor. Some examples for this space include tissue paper (which my daughter organized by color), full size bows, scrap booking supplies, pattern books, etc. The beauty of the stackable cubes is you can utilize wall space around the windows and not have to worry about the contents getting squished or damaged. Lastly, I added a “ClosetMaid Cubeicals® 8 Cube Organizer White” that was two rows wide by four rows tall or it could be laid down depending on your available space. This component is part of the same storage line, so matching drawers were no problem. These are devoted to yarn that I can now group by type for easy access. So in the end, I obtained three storage pieces that keep a wide variety of supplies at my fingertips and opened up a ton of space in the garage, which is always a good thing! I hope this information was useful and might give you some ideas to help with your storage needs. Great tips. We just redid Kimberly’s craft room, We had a bunch of those cubicles type set up, we kept some, but instead added a full shelving unit on the one wall. The room looks twice as big now for some reason. Not sure why but it does. If the guests don’t come to often I would do it! Give the guests a tent! Ok, all this sounds wonderful and it looks great. I love it, wish I could do something similar, but where is the table? Where do you actually work on your crafts? I have a square gathering table in my kitchen that seats eight so I have plenty of room to spread myself out. I don’t need a table for that much because I don’t work with beads but if I do need it it’s a great table. I also lay my scarves out on the dining room table to measure them and that works out really well. Nicely done! NOW the trick is to keep it looking that good! So true. My biggest challenge is taking the time to put everything back. I pull stuff out and then I get distracted But all in all it’s pretty easy to keep neat. Since I am making one room have two functions, for this size space it’s working out really well. I’m jealous! Partly because of the window!! And such nice looking storage. I love that window seat!!! I live in a small one bedroom apartment – just me & the JazCat, I have 3 dressers & my couch in the front part of the living room – 1 has Christmas decorations, the other 2 mostly yarn. Then behind the couch, I have 2 stacks of 5 high large plastic tubs, another dresser for- yarn & wrapping supplies. My “dining room” area – I have what used to be a wood twin bed frame that I put shelves in – has all fabric, next to that is milk crates stacked 6 high. And my small dining table – where my sewing machine sits. My bedroom has my work table – for stained glass mostly, that I built about 20 years ago that has shelves under it, along with a small book case that sits on top of a 3′ x 2′ tall “stereo cabinet for glass supplies.. Oh yeah, then I have a 12 drawer plastic “scrapbook paper containers” that I have beads and paper in! Yeah, I have lot of stuff! Wow – Debbi Your “guest house” sounds really nice. Admin – LOL give the guests a tent!